March 8 – International Women’s Day – has a history that goes back more than a century and it has been marked on campus by the students and staff of Pearson College UWC for all of the school’s existence. But this year, for the first time and with the support of President and Head of College Désirée McGraw, the school has declared a programmatic theme of Women’s Empowerment from March 2019 to March 2020. “Over these 12 months, this theme will guide co-curricular offerings, provide direction for our external relations and engagement, and influence our core educational program whether it be through Global Affairs speakers, Special Topics days, or project weeks,” says Alumni and Community Engagement Officer Julia Norman, one of the driving forces behind this initiative. “Pearson is a UWC school that is uniquely positioned to champion the important, world-changing concept of women’s empowerment,” Norman adds. “Our leadership is female, we have staff and faculty with expertise and extensive experience in this area, we are Canada’s School for the World and we are integral part of a country that has publicly aligned itself with feminist values of gender equality and women’s empowerment. Norman notes that the week of International Women’s Day marked the unofficial kickoff to this year and on campus, a number of events were scheduled, including panel discussions, a film screening and a workshop of the development of monologues to help individuals craft their stories of womanhood, or of simply knowing a woman! 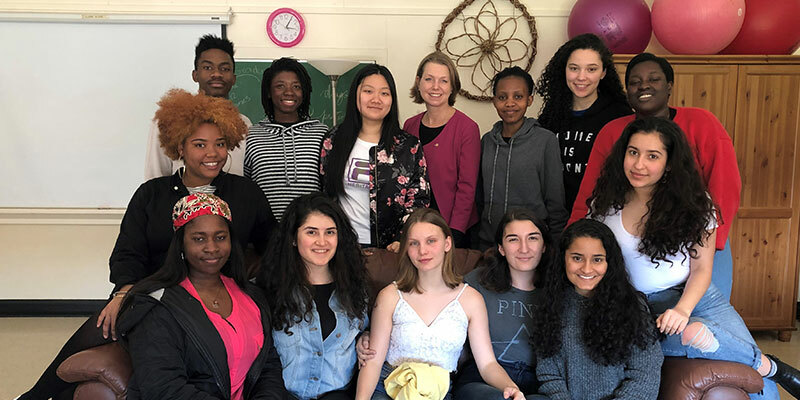 One of the milestones is expected to be participation by Pearson students in the upcoming Women Deliver conference slated for Vancouver June 3-6. A delegation of 22 Pearson students are expected to attend and participate in the conference. Looking further out, Norman is working with students to provide home service project templates and support for (connections, development and planning support, mentorship) women’s empowerment projects for first years working in their home communities over the summer break. As well, she is collaborating with faculty member and Global Affairs Coordinator Shefa Siegel on a 2019-20 speaker series that will explore numerous intersections and tracks of women’s empowerment and gender equity. A variety of other initiatives are under consideration so keep checking Pearson College UWC social media channels for more information throughout the year.